George Graham Reviews Cloe Albet's "Dedicated State"
Canada has a rich tradition of singer-songwriters going back to the 1960s folk days with Gordon Lightfoot, Ian Tyson, Joni Mitchell, Neil Young, Bruce Cockburn, and the late Stan Rogers to name a but few of the influential ones. This week we have a first-rate recording from a young artist from Edmonton, Alberta, whose debut CD is now being released south of the border, Chloe Albert. Her CD is called Dedicated State. Chloe Albert was born and raised in Edmonton and took up music at an early age. An old piano given to her by a family friend piqued her interest and soon led to classical piano lessons, but by age 14, she took up the guitar, one borrowed from her mother. By age 16, she was playing in open-mic sessions at regional clubs. She decided to major in music, studying at Grant MacEwen University in Edmonton, performing with various groups on campus. There one of the differences between the US and Canada came into play -- she competed for and won grants from the Alberta Foundation for the Arts and the Edmonton Arts Council in 2007 for the production of her debut album. The recording apparently took place over an extended period, as she was balancing her career and life, but Dedicated State was completed in 2008. She worked in Edmonton with co-producer and multi-instrumentalist Louis Sedmak, enlisting a talented bunch of guest players on the Edmonton scene, though few of them are well-known to American audiences. But their playing is world-class, as are Ms. Albert's songs and vocals. The CD led to her being awarded Emerging Artist of the Year prize in the Canadian Folk Music Awards. Her music covers many of the familiar topics of relationships in various states of coming apart or attraction, sometimes in the third person. And while the subject matter has been considered in various forms before by Ms. Albert's numerous predecessors, her CD's strength is in its execution, with fine performances at every level, from Ms. Albert's thoroughly appealing vocals to the eminently tasteful musicianship to the fine, understated production that emphasized acoustic instrumentation, and which features different instrumental textures on almost every track. The influences can range to a hint of country with a Dobro to some jazz with a soprano sax. 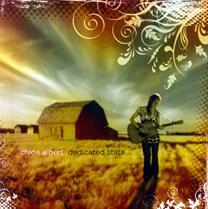 Chloe Albert's CD Dedicated State, was made some five years ago in Edmonton, Alberta, and won accolades in Canada. But it is only now being promoted in the US. Her website says that she is working toward a second release. But this kind of music is timeless. It's the epitome of a fine singer-songwriter record, with intelligent, literate writing, appealing vocals and very tasteful production and musical arrangements. The music doesn't stray far from the kind of contemporary folkie stream, but its strength is in its uniformly high quality. On the sonic front, we'll give the CD a near grade "A." The recording is clean and warm and the uncluttered sonics further enhances the songs. The dynamic range is also a little better than average. Canada has given us a lot of very good singer-songwriters. Chloe Albert is a name we should add to the list.